ammonia synthesis catalyst is used to remove CO and CO2 at low concentration with high crush strength, large pore volume, high activity and easily to be unloading. BSA series has high activity, steady performance and long service life with high resistance of thermal and poison than other items. It is mainly used in ammonia synthesis industry, making ammonia by reaction of hydrogen and nitrogen, also it can be used in metallurgy and electronic industry. 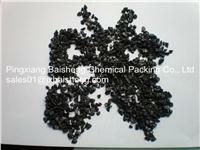 This catalyst is mainly consisting of FeO, Al2O3, K2O, CaO.